Just across Independence Avenue from the U.S. Botanic Garden Conservatory is a favorite "secret" garden of many Washingtonians. Part of the U. S Botanic Garden campus since 1932 when it was created, Bartholdi Park is a two-acre garden that showcases innovative plant combinations in a variety of styles and design themes. It serves as a demonstration garden where visitors can learn to apply the latest horticultural techniques to their home landscapes. The plantings are constantly updated to showcase new varieties, design trends and garden maintenance methods. In warm weather, enjoy the centerpiece of the Park, the Fountain of Light and Water, commonly called the Bartholdi Fountain in homage to its creator Frederic Auguste Bartholdi. This cast-iron fountain weighs more than 15 tons and stands 30 feet tall. The lights surrounding its basin are illuminated at night. 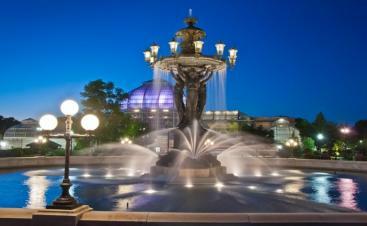 Bartholdi Park is a refuge from the stresses of the city. Secluded benches offer quiet shade in the summer and sheltered sunlight in the winter. Every type of plant is represented in the Park - deciduous trees, evergreens, shrubs, perennials, annuals, vines, ground covers, roses and bulbs. In every season, the colors and textures of the plants and flowers are exhilarating. Bartholdi Park is being redesigned as a Sustainable Sites Initiative(tm) pilot project. It will include a demonstration garden for homeowners. The focus will be on different garden styles and plant options that all can be achieved using SITES guidelines. Each demonstration will be a synergistic solution for dynamic and holistic systems that can be interpreted for the home gardener, helping improve garden design and maintenance practices nationwide. The renovation of Bartholdi Park at the United States Botanic Garden (USBG) is complete, and the new garden is a showcase of sustainable gardening. 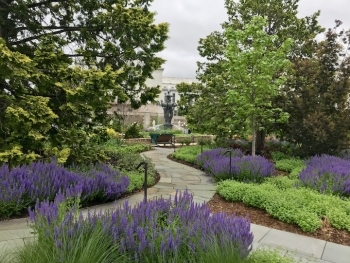 Created in 1932, Bartholdi Park has served as a demonstration garden for more than 80 years and until 2016 had not undergone a complete renovation since its original construction. The renovation provided an opportunity to increase accessibility, showcase the Sustainable SITES Initiative (SITES) principles in action, and demonstrate USBG's commitment to sustainability. Created in 1932 when the U.S. Botanic Garden was relocated, the park was renamed in 1985 after Frederic Auguste Bartholdi, the sculptor of the historic fountain located at its center. The gas lamps made the fountain a popular destination in the 1880s as one of the first attractions in the nation's capital to be brightly illuminated at night. Originally, the beds in Bartholdi Park were geometrically arranged and planted in formal classical style to feature the fountain and to accommodate public gatherings. The plantings have been redesigned during the last decade and are continuously updated to reflect modern trends in American horticulture and new plant introductions.